With no offence to my awesome kids, the best present for me is a day of no-obligation sewing. Just me and the chance to play. So when Hubby offered that up one afternoon on Mother's Day weekend I took advantage. Sure, it was tempting to sip tea and read but I decided I needed to flex my muscles and take something off the very long want-to-do list: Floral Wraps. In one long afternoon I got five of them cut and nearly all sewn to completion. I was an assembly line machine. Barely took a washroom break. And it was so worth it. Not only was it satisfying, but now I have these great gifts. The pattern comes from my book, A Month of Sundays. These days we have reusable totes, shopping bags, and even snack bags. But I'd never seen a reusable floral wrap. Sure, the flowers are gorgeous, but the paper and plastic they come wrapped in, not so much. 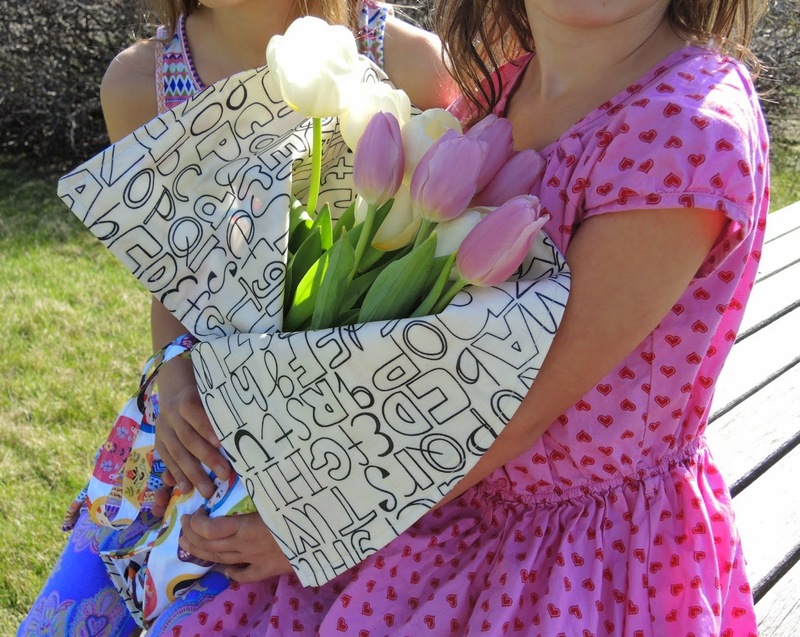 Now you can buy your own flowers and bring them home safely and in style. 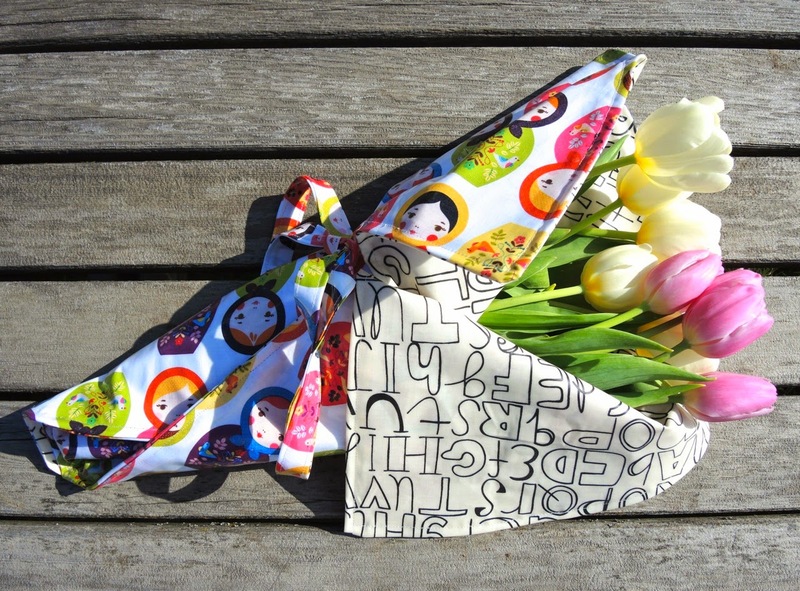 Or, you can make a wrap and give it as part of the gift! 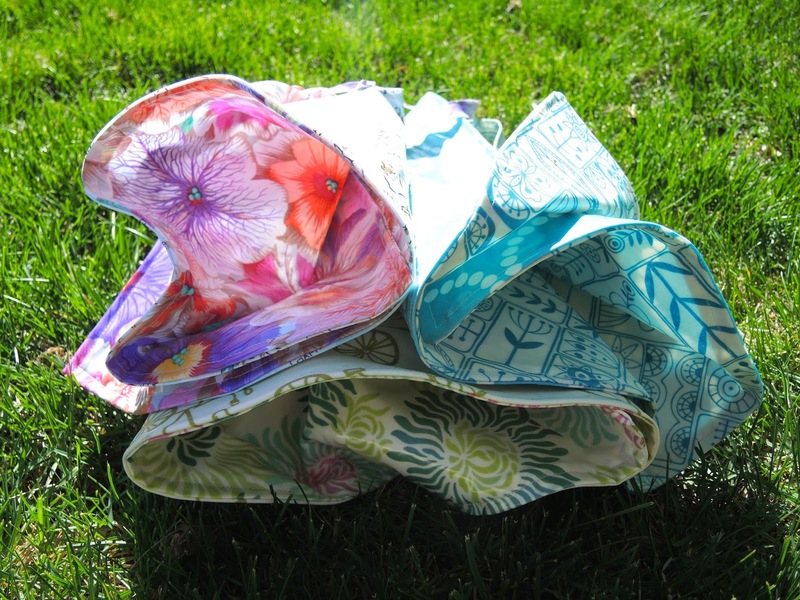 The floral wrap uses laminated cottons. There are so many available these days. You could, if you preferred, make your own by laminating vinyl to your favourite material. I am lucky, though, in having a few local shops with a good stash of laminated cottons. (In fact, I may need to stock up a bit more now.) Oil cloth works too, but it is a bit stiffer to work with. If you can't source them locally, make sure to check out your favourite online retailers. Each wrap contains a pocket to hold the stems and ties to keep it all together. By using the laminated cottons your wrap can be simply wiped dry when you load the flowers into a vase, not to mention the ability to keep them moist as you transport. This is my favourite project from your book! It is so European. Love them!